NEW PALTZ, NY (July 24, 2015) – Historic Huguenot Street has announced the return of Artists on the Street, an all-day plein air event showcasing the talents of over 20 renowned Hudson Valley artists. 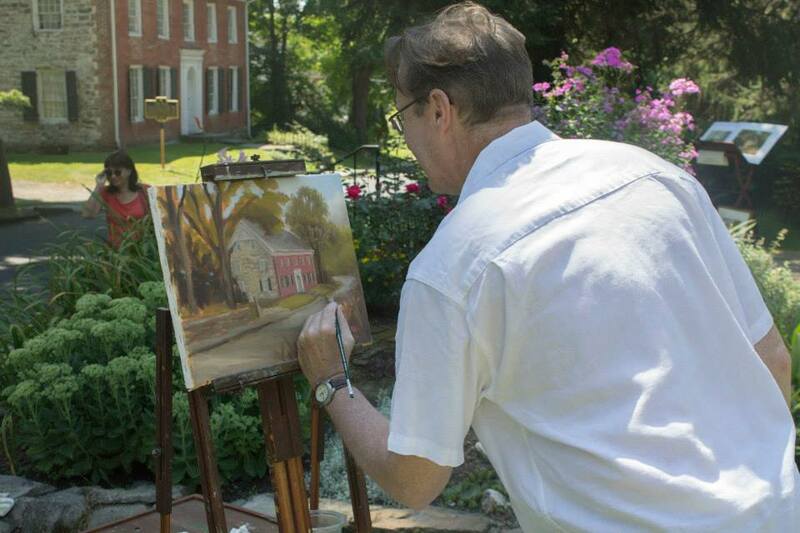 The annual event, which is taking place for the third time on August 8, is an opportunity for the public to watch and engage with local artists as they work, creating paintings and watercolors inspired by the landscape of the National Historic Landmark District. A number of artists from previous years are returning for this year’s event, including Kevin Cook, Mira Fink, Jim Adair, and John A. Varriano. Maps will be available denoting the location of each artist across the site. In addition, visitors will have the opportunity to view the Portrait Gallery in the 1799 House (54 Huguenot Street). At 4 pm, artists will bring their work to the DuBois Fort (81 Huguenot Street) to be displayed and made available for purchase during an hour-long catered reception, sponsored by Bridgecreek Catering, Brotherhood Winery, and True Value of New Paltz. The artwork will remain on display for purchase in the DuBois Fort for one month. This event is free and open to the public, rain or shine. Saturday, August 8, 11 am – 5 pm.